We are tree surgeons in Stretford that have experience of over 30 years. The business is run by Andrew Hampson and his skilled team who are highly professional tree surgeons. All the work we do is carried out to a high standard and you can be rest assured as we are properly qualified and fully insured for every unexpected eventuality. We price our jobs competitively. We offer a quick response on all contact made to us, so get in touch with us today! We come with the right tools and a plan so that the job goes smoothly. We always deliver high quality results in a fast time. We do what is asked of us and leave the area clean and tidy. We always take our cuttings to be disposed of correctly. We quote reasonably & are open to price matching. We want our customers to keep coming back to us, so we always deliver. We help you get the best possible outcome for the job with a smile on our faces. Find Out What Our Previous Customers Said About Us! We are tree surgeons in Stretford that are both trustworthy and we are competitively priced. Every job that comes to us has to be quoted individually as each job has different factors that influences the price. When quoting we consider where the tree or hedge is, look to see what other buildings or plants are around that need to be protected in the process and we also consider how difficult or easy it will be to get equipment to the site through alleyways, over walls and any other factors along the way that may make it more difficult. Our Rough Guide Of How Much It Costs For A Tree Surgeon In Stretford! 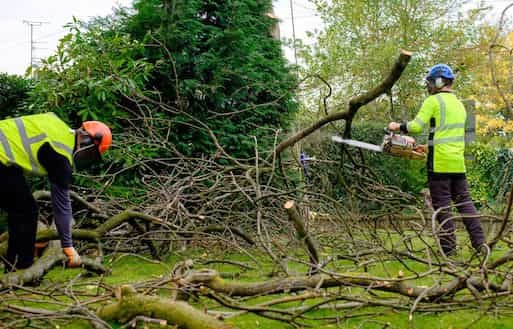 The cost of a tree surgeon in Stretford can vary but we quote within reason! Below will give you a rough idea of how much we charge for jobs, but please don’t forget that we will have to quote for your job individually. We are serious about what we do and are all City & Guilds qualified tree surgeons. This means we have been through all the tree surgery courses to make sure we are knowledgeable and safe. This gives both you, and us, peace of mind that the job will be carried out properly and safely. We pride ourselves in having specific knowledge about different species of trees and hedges – this means that we only remove a tree or hedge so they do not grow back, or trimmed in a fashion that means it will not die after we leave. We will always advise on which time of year is best to trim certain species to give it the best chance of recovery as possible. We are professional, friendly and efficient. We know that having us around at your home or work space can be quite loud but we will be respectful as possible when it comes to loud levels. We are also a pleasure to be around and have a great attitude so we will get the job done with a smile on our face! . We have top notch customer care and we always return calls, emails and texts so you know what is happening with your job. We endeavour to keep you informed during the whole job so you feel looked after, and we know what we are doing. Why not get in touch with our friendly Stretford tree surgeons today! Looking for a tree surgeon in Manchester? We also serve other areas outside of Stretford!